Peter Paul made all kinds of candy, including Walnettos and Power House (its only chocolate bar that didn't come in two pieces... and this isn't a healthy energy bar... they haven't made it in decades). Hershey bought the company and limited the selections to Almond Joy and Mounds. You may see some occaisonal special editions, like milk chocolate Mounds and dark chocolate Almond Joy. It was because Hershey already makes so much. Walnettos are made now by a small company in California. I liked Almond Cluster bars, though they were more expensive (35 cents in Hollywood, Florida--circa 1967). The Peter Paul company decided to stay with Almond Joy and Mounds Bars. 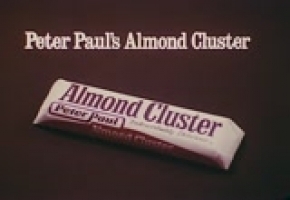 Almond Cluster was off the shelves by the early 1970's.